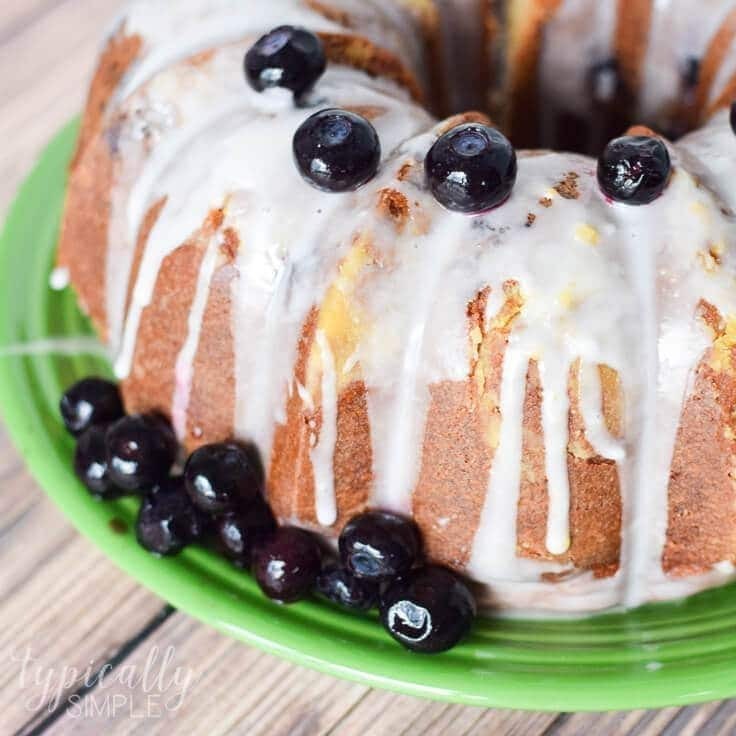 This lemon blueberry pound cake recipe is packed full of yummy blueberries! And it has just a hint of lemon which makes it a refreshing dessert for summer! Hi there, Kenarry readers! 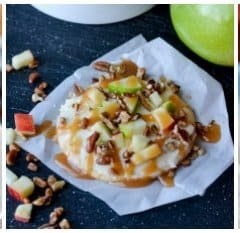 It’s Kelly from Typically Simple and I’m back with another delicious dessert recipe! Now usually I share pretty simple recipes that can be thrown together in about 10-15 minutes, like the Monster Cookie Bars and Apple Crisp. 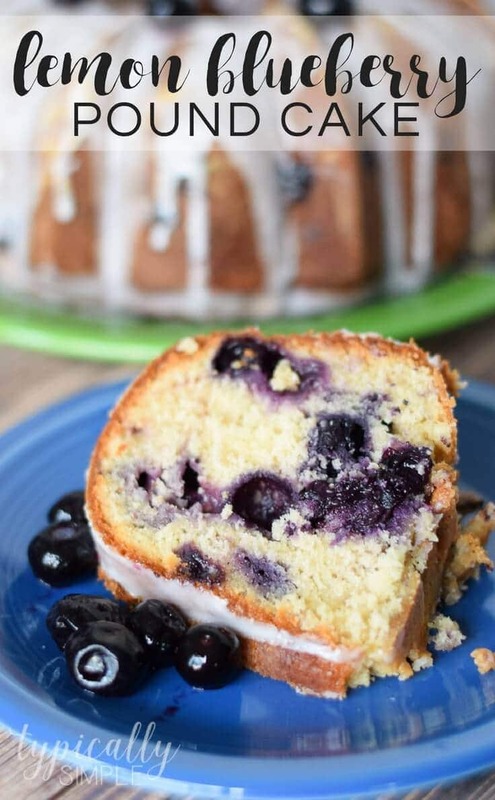 However, this time I’m sharing a yummy pound cake recipe that takes a little more time, but let me tell you – it’s definitely worth it! 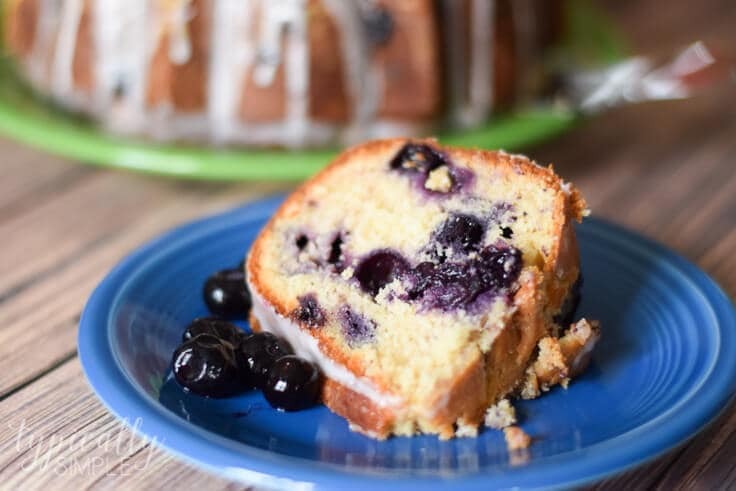 With blueberry season just around the corner, this is a perfect dessert to bake with fresh blueberries! It’s also equally yummy with frozen blueberries, which I decided to use when I made this since the stores around here do not have many fresh berries quite yet. There’s just a hint of lemon flavor in the pound cake itself, so I decided to add a little lemon glaze to the top of the cake. It is the perfect balance of tart and sweet! I also served it with a dollop of whipped cream to add a little more sweet to the mix. In a small mixing bowl, whisk together the flour with baking powder and salt. Set aside. In a larger mixing bowl, cream together the butter, brown sugar, and white sugar on high speed. Add the eggs one at a time, mixing thoroughly after each egg. Beat in vanilla extract. On low speed, add flour mixture a little at a time, alternating with the greek yogurt. So about 1/3 of the flour mixture, mix, half the greek yogurt, etc. In a separate bowl, toss the two cups of blueberries with a little flour to coat them. Fold into the batter. 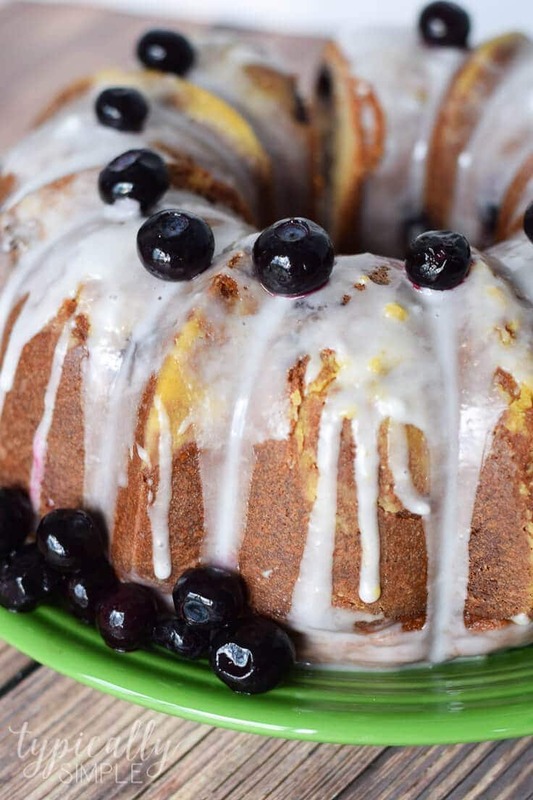 Generously coat the bundt pan with cooking spray and spread batter into pan. Bake cake for about 60-70 minutes, or until a toothpick inserted into the center of the cake comes out clean. Whisk together the flour with baking powder and salt in a small bowl. Set aside. In a large mixing bowl, cream together the butter and sugars on high speed. Add the eggs one at a time, mixing throughly after each egg. Beat in vanilla extract. On low speed, add flour mixture a little at a time, alternating with the greek yogurt. To make the lemon glaze, just add a few tablespoons of lemon juice to a cup or two of powdered sugar and mix well. I used 3 tbsp lemon juice and 1 1/2 cups of powdered sugar to make mine and it was a good consistency that drizzled nicely over the cake. Cover tightly with saran wrap until you are ready to serve it. 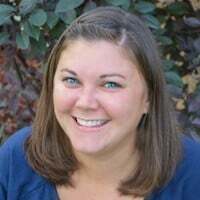 Follow Kelly on Facebook, Twitter, Pinterest, Google Plus and Instagram.